Ania Loomba is Professor of English at the University of Pennsylvania. She received her BA (Hons. ), M. A., and M. Phil. degrees from the University of Delhi, India, and her Ph. D. from the University of Sussex, UK. She researches and teaches early modern literature, histories of race and colonialism, postcolonial studies, feminist theory, and contemporary Indian literature and culture. She currently holds the Catherine Bryson Chair in the English department. 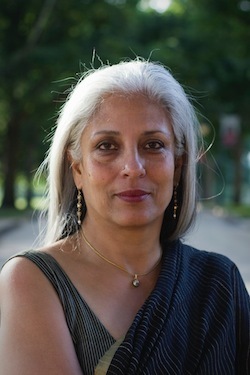 She is also faculty in Comparative Literature, South Asian Studies, and Women’s Studies, and her courses are regularly cross-listed with these programs. Her writings include Gender, Race, Renaissance Drama (Manchester University Press; 1989; Oxford University Press, 1992), Colonialism/ Postcolonialism (Routledge, 1998; second edition, 2005; with Italian, Turkish, Japanese, Swedish and Indonesian editions) and Shakespeare, Race, and Colonialism (Oxford University Press, 2002). She has co-edited Post-colonial Shakespeares (Routledge, 1998); Postcolonial Studies and Beyond (Duke University Press, 2005), and Race in Early Modern England: A Documentary Companion (Palgrave, 2007). She is series editor (with David Johnson of the Open University, UK) of Postcolonial Literary Studies (Edinburgh University Press). She is currently working on the lives of left-wing Indian women of the 1940s and 1950s, and co-editing (with Melissa Sanchez) Rethinking Feminism: Gender, Race and Sexuality in the Early Modern World. The lecture will take place on April 16 at 7:00 p.m. in the Bondurant Auditorium.